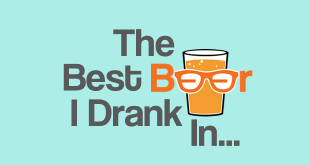 I’ve been to a lot of breweries over the last few years. Most are on big out of town industrial estates or previously disused arches under railways tracks. But not Cantillon. 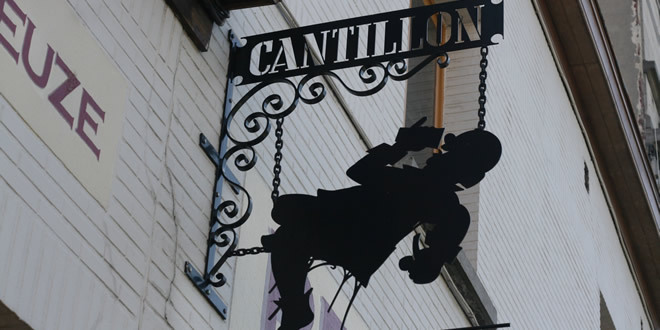 Their brewery is on a normal street, in a normal part of Brussels. Which is odd really, as the beer they brew is far from normal. Inside is a world away from any other brewery I’ve ever been to. Usually bright and shiny, clean and sanitised. 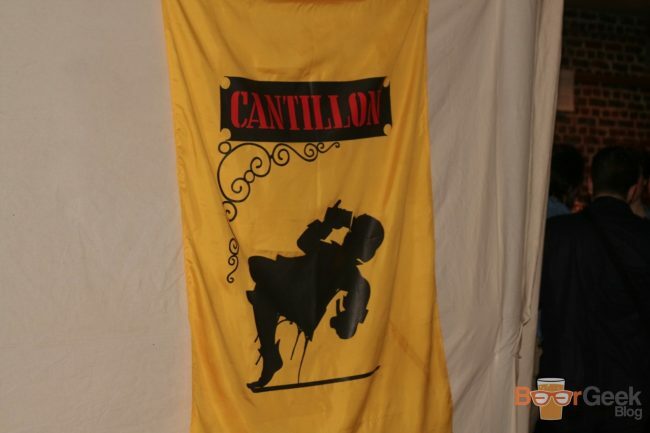 Cantillon is dark and dingy. 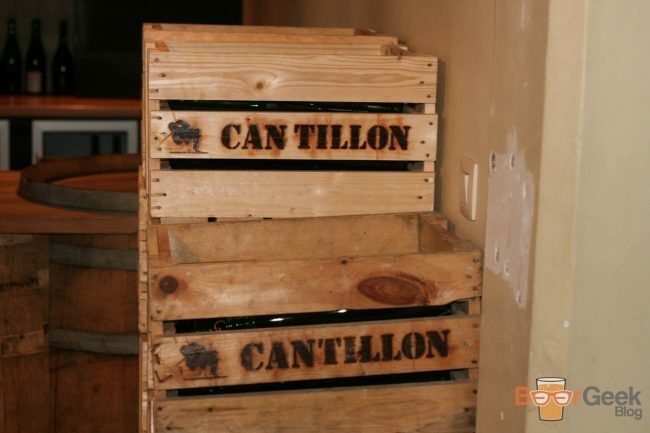 There are wooden casks and crates everywhere, caked with dust. 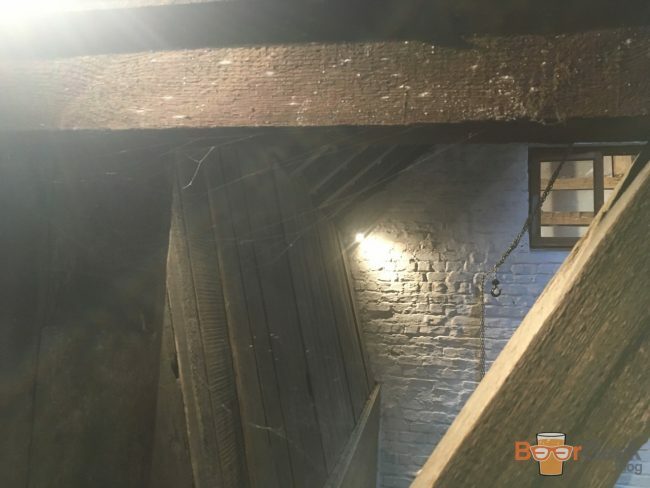 Wooden beams are covered with cobwebs and even mould. Then there’s the smell. Damp and musty with the odd hint of wine-like acidity. All of this is entirely intentional, of course. Walking through the cramped corridors feels like you’re in a museum. I didn’t know it at the time but it turns out you actually are! The 116-year-old brewery is still fully operational. But due to its use of traditional brewing methods and ancient equipment, it’s known as the ‘Musée Bruxellois De La Gueuze’. 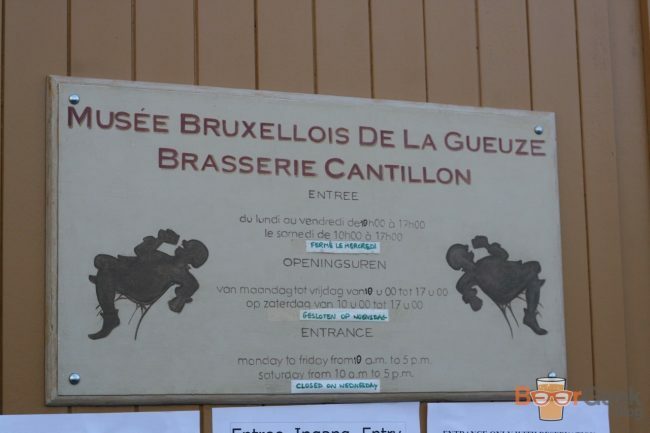 Or the Museum Of The Gueuze’. Walking around it’s easy to see why. 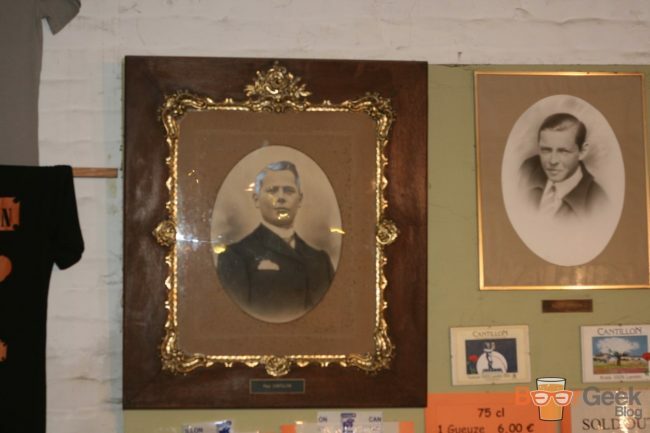 Everywhere you turn there are antique looking artefacts. As well as fascinating machinery. Ancient but still used. 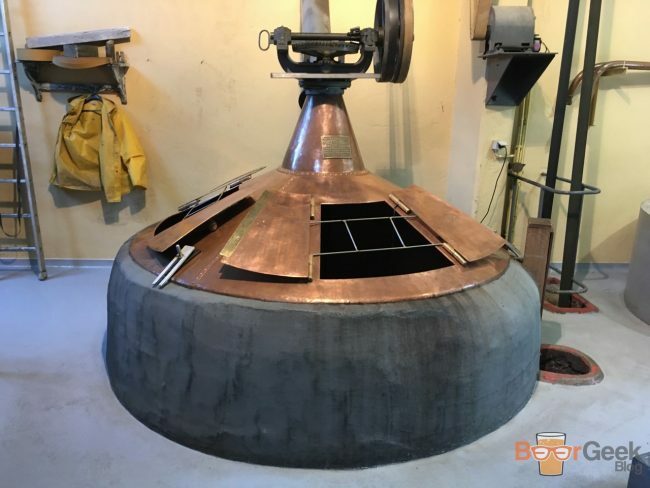 Like this stone and copper mash tun where their beers are brewed. And the famous koelschip (or coolship) in the attic where the beer is left to spontaneously ferment. 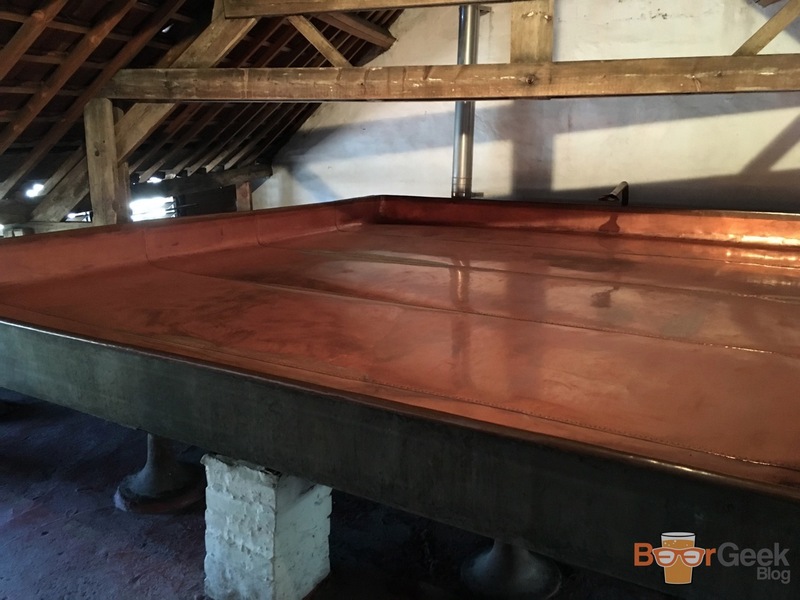 That’s why they’re so happy to leave the brewery unsanitized – the age-old bacteria in the air is what makes their beers so special. But I wasn’t just there to admire the decor. This was Quintessence. A ticket only event held every couple of years that sells out months in advance. During which we’d get to taste 23 different beers. Many of them rare or exclusive. It wasn’t long before the first beer was poured. Starting with Grand Cru Bruocsella. 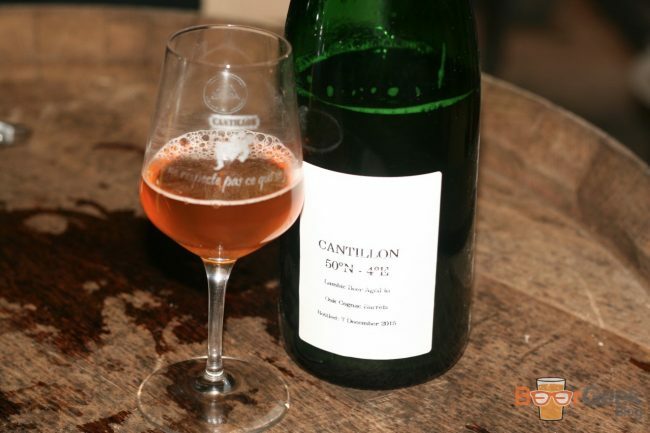 A dry, three-year-old unfiltered lambic. Was funky, earthy and musty. A great way to kick things off. 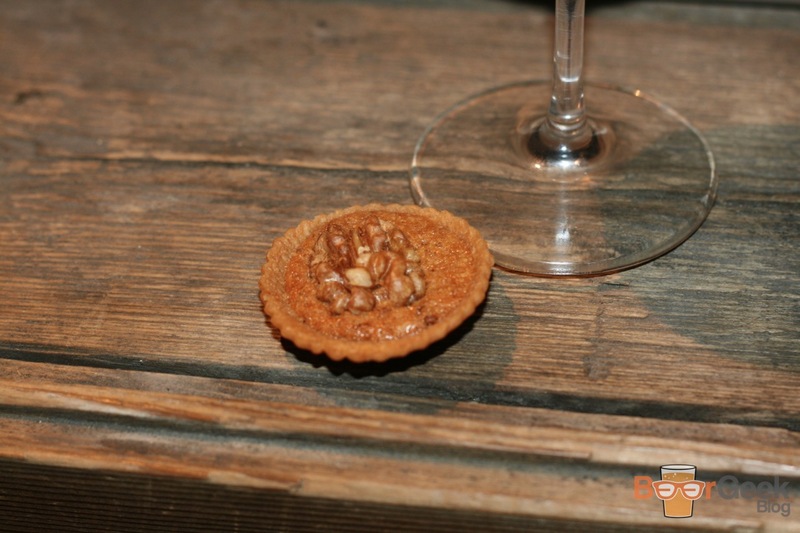 Most of the beers were served with a small food pairing. The first being ‘Plattekeis’, a fresh, soft white cheese. 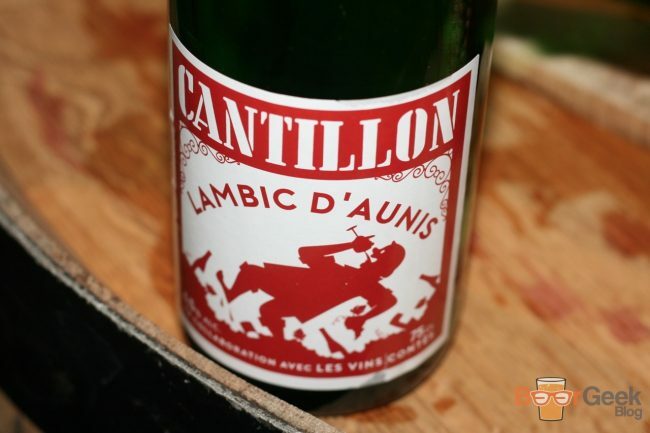 Next up were a couple of grape lambics, produced in collaboration with different vineyards. 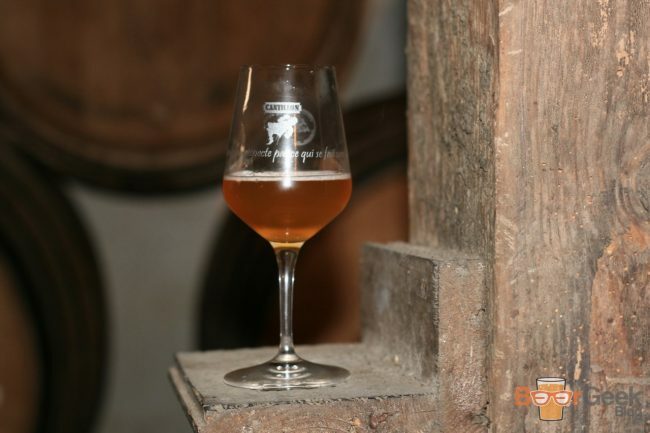 First, Aunis, brewed with the Pinot D’Aunis grape from Les Vins Contés. 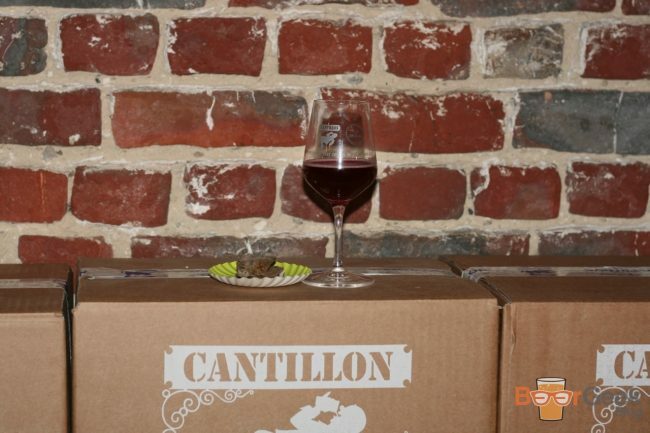 A lovely light red colour with a grape aroma and soft wine like taste. Served with slow cooked pork cheek by chef Philippe Renoux. And then Zelige. A grape lambic made in collaboration with the Domaine Zelige Caravent vineyard. An amazing colour with huge fruity red wine characters. It actually tasted closer to wine than beer, in a good way. The fourth and fifth beers were also vibrant red colours but for very different reasons. There’s absolutely nothing wrong with Lou Pepe Kriek, far from it. It’s a quality beer, for sure. But cherry has never been a flavour I particularly enjoy in anything other than actual cherries. So Kriek beers are not usually for me, even Cantillon’s. 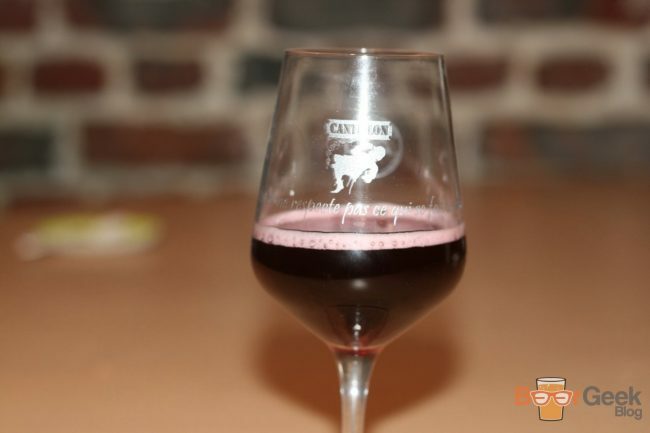 Rosé de Gambrinus is an absolute stunner, though. I’ve had this beer at several different ages from one to three years typically. 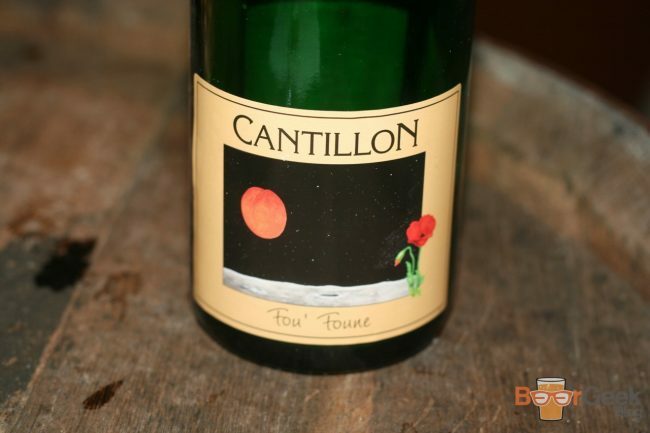 This one was bottled just three weeks earlier. And it showed. The raspberry flavour was so much more prominent than ever before. This is sour beer heaven; tart, fruity and funky. 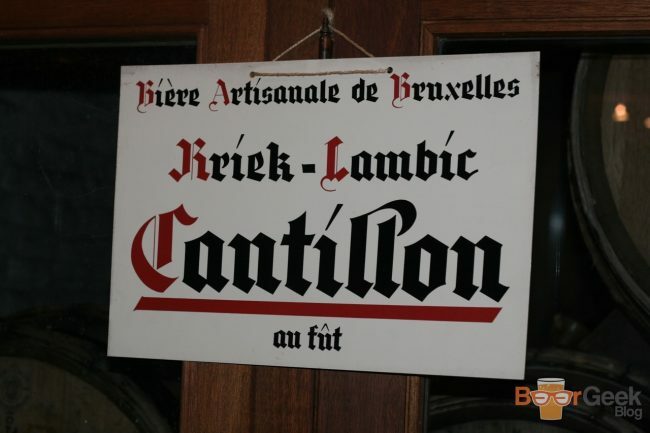 The best bit is that the raspberries taste fresh and real, something that a Kriek rarely manages for me. It was served with pork rillette, the Lou Pepe Kriek with a rich pâté. A couple more grape/wine based beers followed. But this time white. Both were stunning, clear highlights of the day. 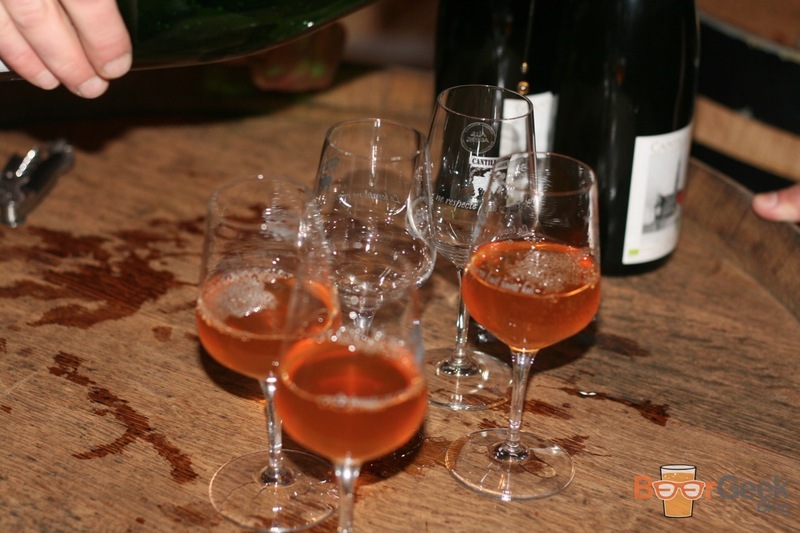 Riesling is a three-year lambic aged in Riesling barrels. Fruity, woody, sour and acidic with big white wine aromas and flavour. Equally good was Vigneronne. A blending of lambic and muscat grapes, slightly lighter and drier but quite similar in taste. 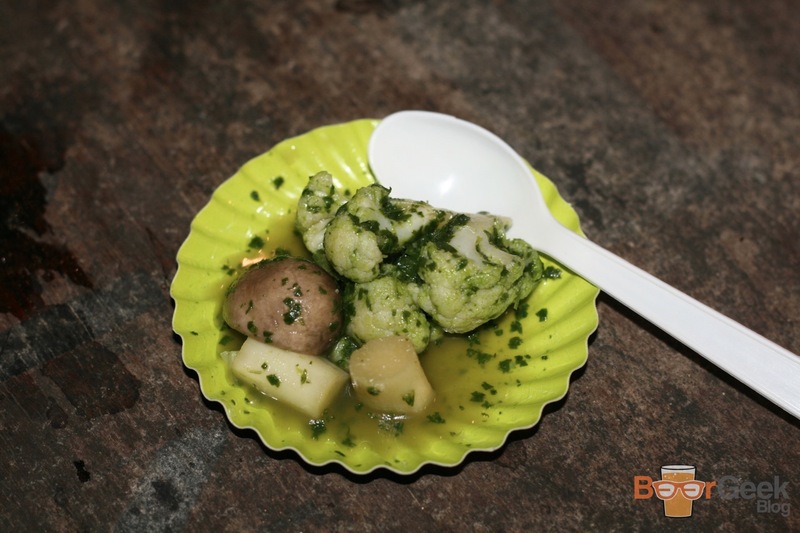 The two white wine based lambics were served with simple vegetables. 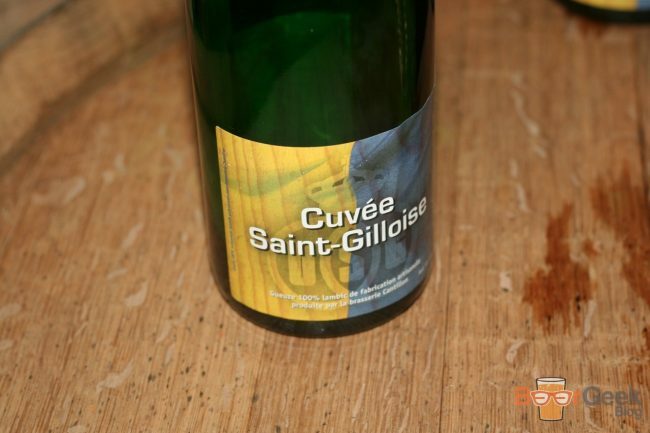 Cuvée Saint-Gilloise was first brewed to celebrate the title winning local football team. More interesting is the fact that it’s dry hopped. 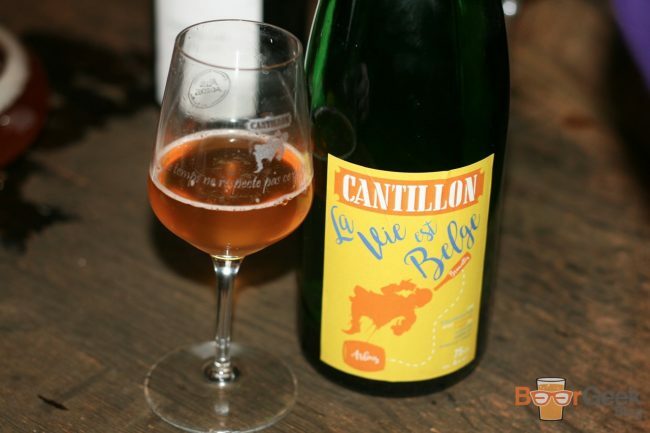 Which gives it a nice hop aroma and an unusual bitterness that you don’t often get in a lambic. It was served with a sweet pecan tart which countered the bitterness perfectly. 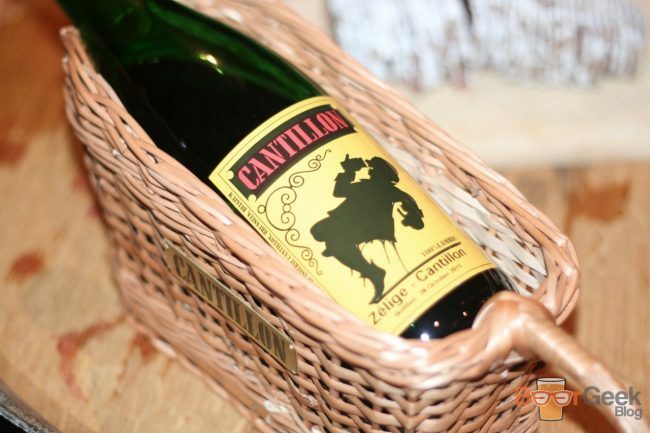 Another Cantillon classic was up next. Fou’ Foune is probably one of my top ten beers of all time. 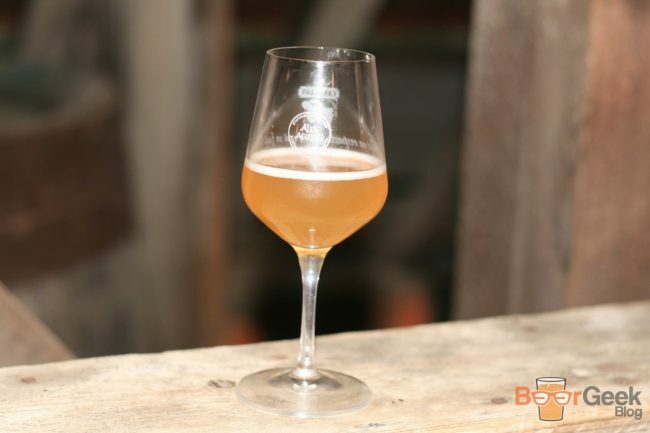 The soft, fruity, crisp and dry apricot lambic is pure perfection in a glass. 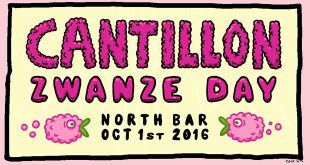 Zwanze Day is an annual event where Cantillon releases a special new beer at carefully selected venues around the world. 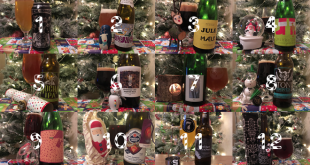 2015’s was a spontaneously fermented stout. While the previous year saw a blend of Iris Grand Cru and Kriek. 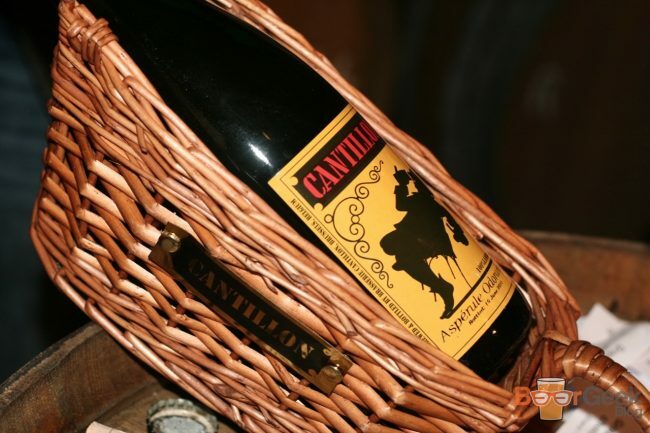 We were treated to the 2012 offering. 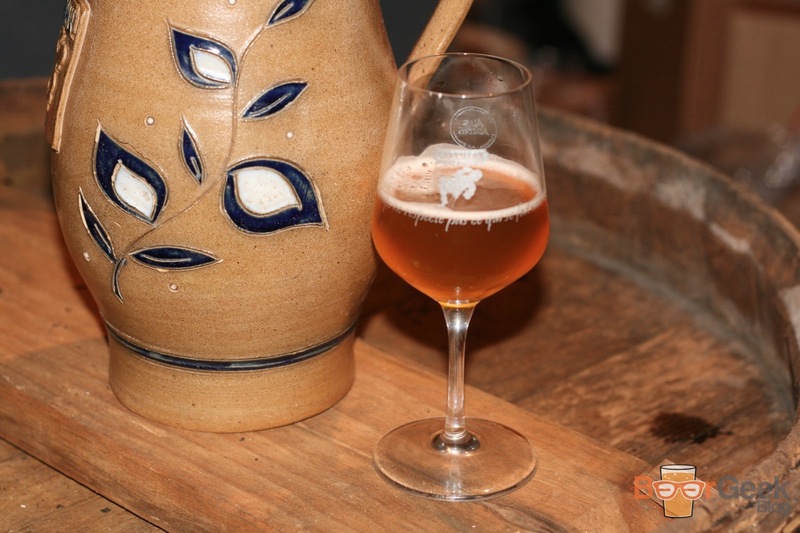 A rhubarb lambic which is a recreation of the very first Zwanze Day beer in 2008. It was nice. Very sharp and acidic but was let down by a lack of distinctive rhubarb flavour. 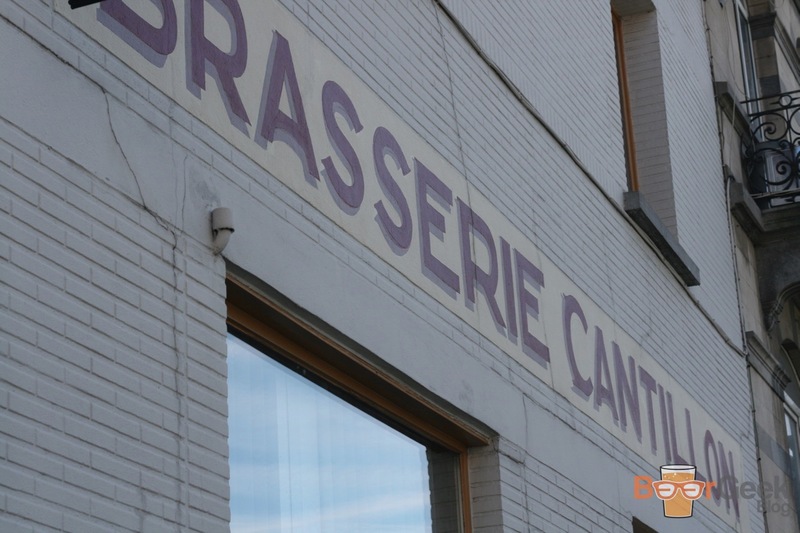 The only disappointment of Quintessence was the guest brewery. The 2014 event saw Cantillon joined by American legends Russian River Brewing Company. 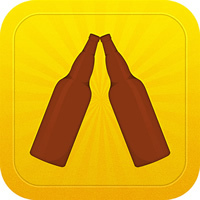 Who brought with them perhaps the world’s most sought after beer Pliny The Elder. 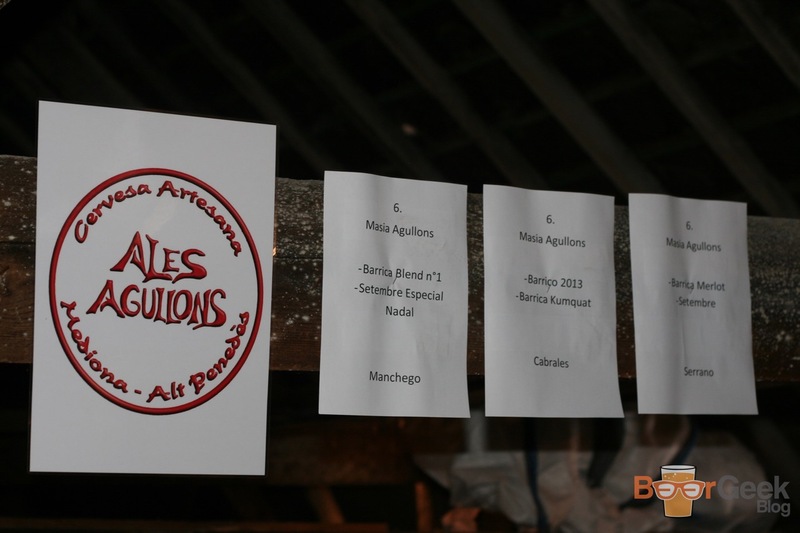 It would be fair to say that this year’s guest Ales Agullons from Barcelona are not quite in the same class. One of their beers, Barrica Blend #1, had an aroma of vomit and didn’t taste much better. While another, Barrica Merlot tasted like weak and watery red wine flavoured beer cordial. Despite hating waste I couldn’t finish any of the four that I tried, not even bothering with the last two. I don’t understand why they were invited. Their beers wouldn’t be great at the best of times. 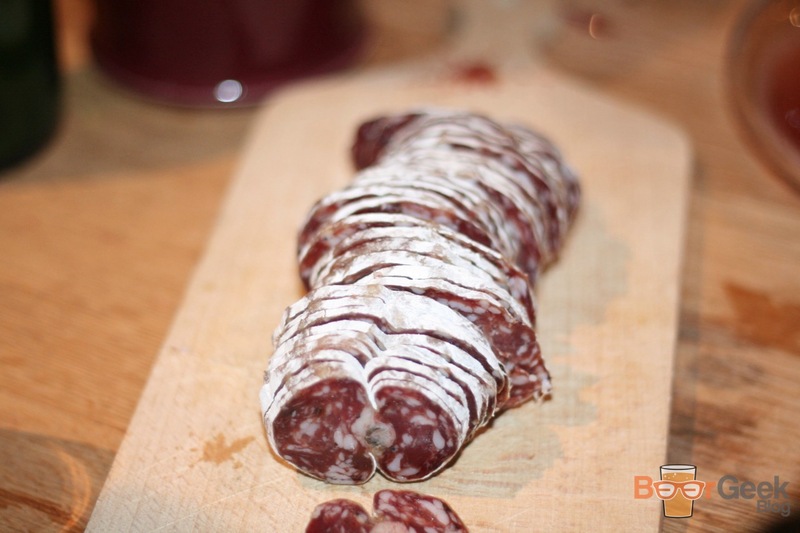 But tasting them directly after some of the best in the world only magnified how poor they were. Things got back on track as we entered the final stretch. 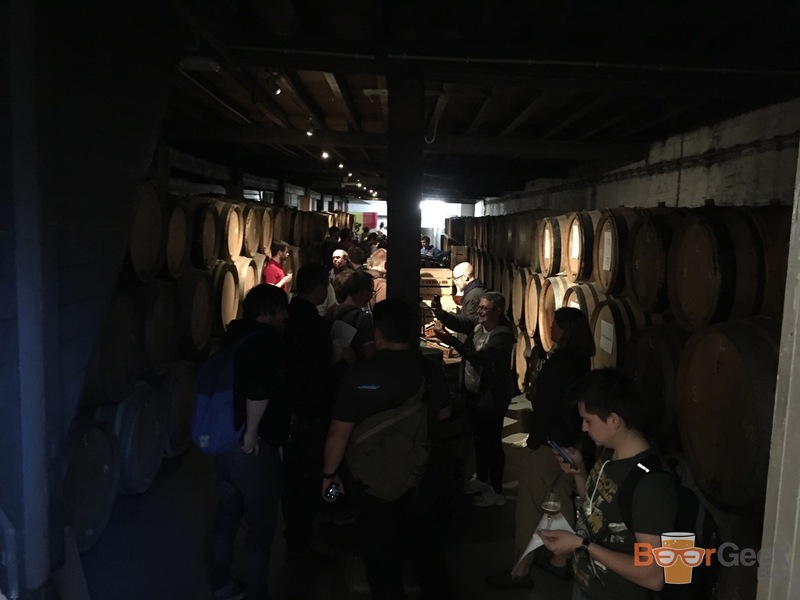 We made our way down to the dark and cramped cellar but more importantly back to Cantillon beers. The most challenging beer of the day was Aspérule. Mainly thanks to the addition of Woodruff, an ingredient I’ve never quite got on with. It had an odd medicinal taste. 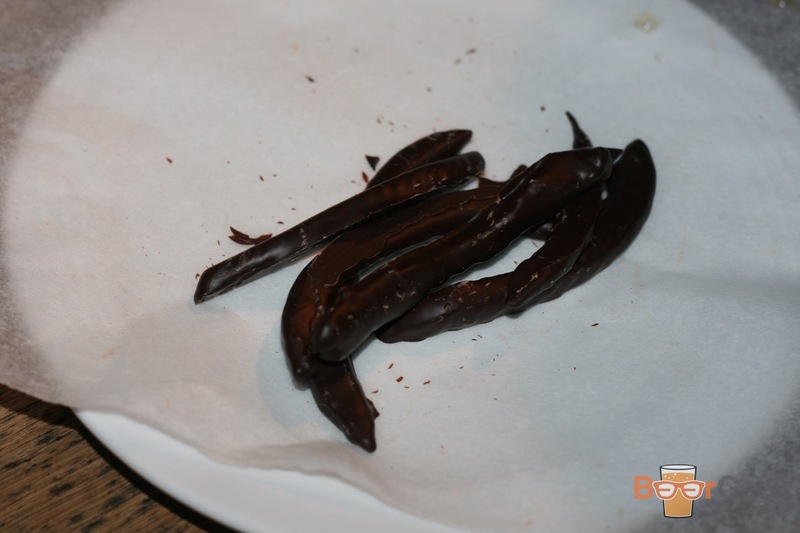 Although I wasn’t completely sold on the beer, it was served with chocolate covered grapefruit zest. And the two together were easily the best pairing of the day. Next was not one but two versions of another of my Cantillon favourites. Iris is unique in that it’s made with all pale ale malt rather than 35% wheat like other Cantillon beers. It’s also hopped differently with 50% fresh hops rather than all dry as is the norm. Perhaps that’s why I like it so much. The 2015 bottle was served with Roquefort. A combination I’d never have considered but which worked really well. 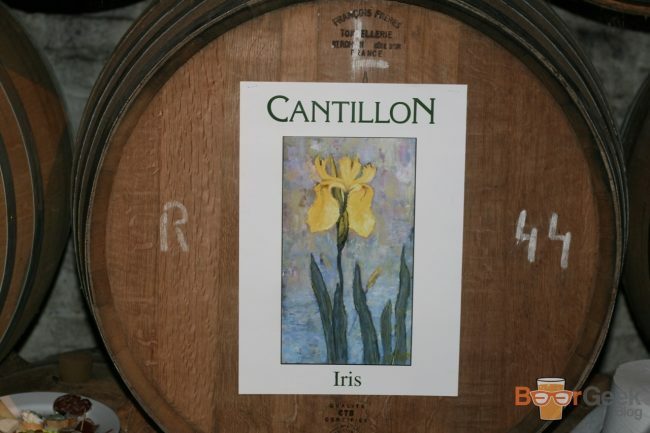 We were then served a draft version of Iris Grand Cru which spends longer in the barrel and isn’t dry hopped. It was enjoyable but nowhere near as good as the regular version for me. 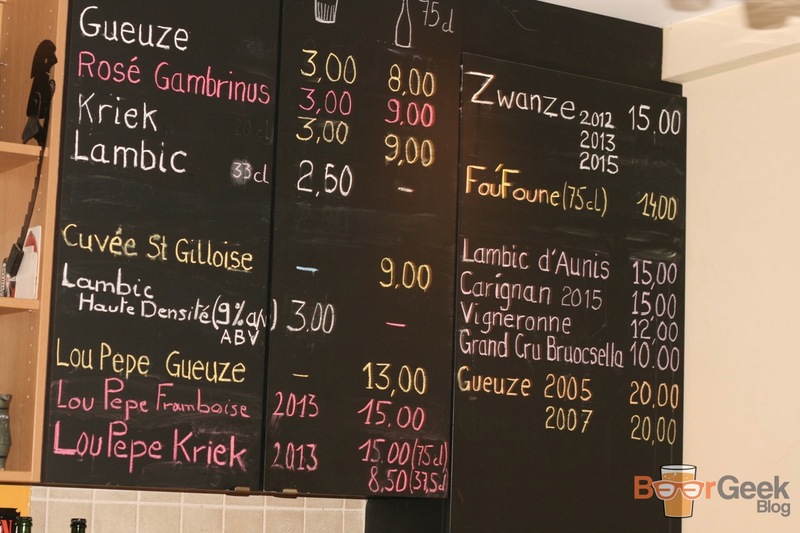 Generally, gueuze is made from a blend of one, two and three year old lambic. 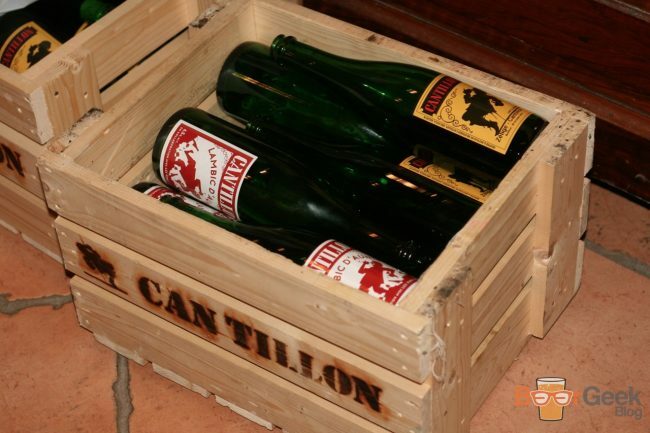 But Cantillon Gueuze +2+3+4 uses two, three and four year olds. Giving it a much mature aroma and taste. More complexity and slightly musty. 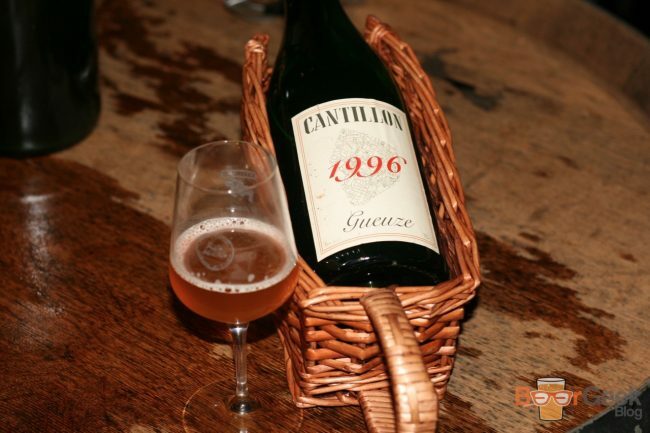 The beer I was most intrigued to try was a 1996 version of Cantillon’s classic Gueuze. That’s right, it’s twenty years old. 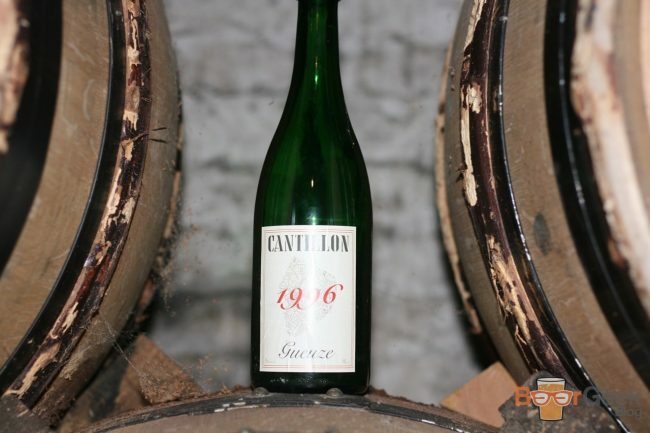 I wasn’t even old enough to drink when it was bottled. Almost unrecognisable from the fresher versions I know and love. So complex. Much harsher, sourer and more acidic. 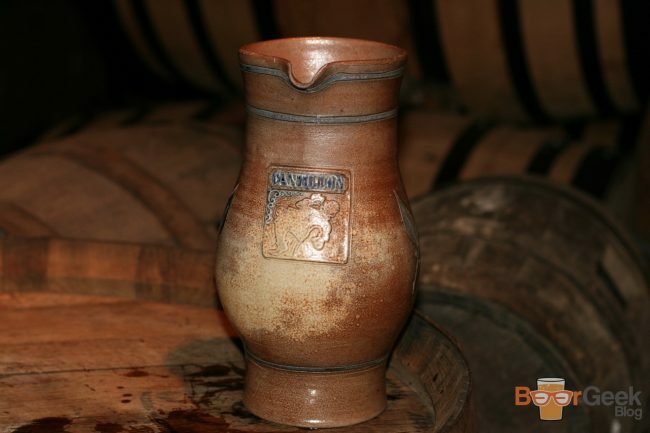 But it has a great aroma and was still incredibly drinkable. It was perhaps a little challenging on its own. 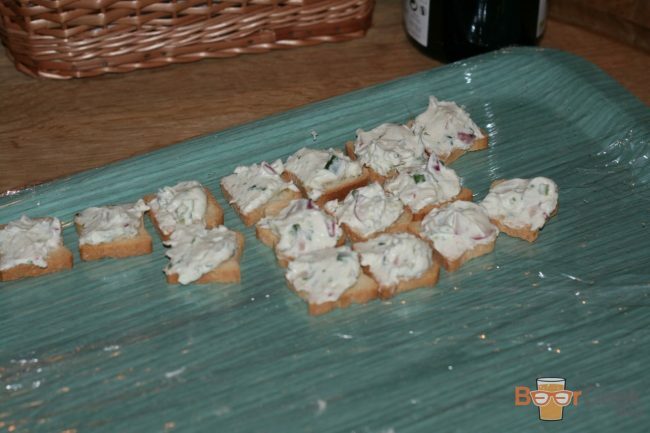 But fantastic with the accompanying rich mackerel rillettes. Whilst it wasn’t my favourite beer of the day it’s the reason Quintessence is so great. You’re just not going to find stuff like this anywhere else. The end was in sight! Just two beers to go. La Vie est Belge was new for the festival. 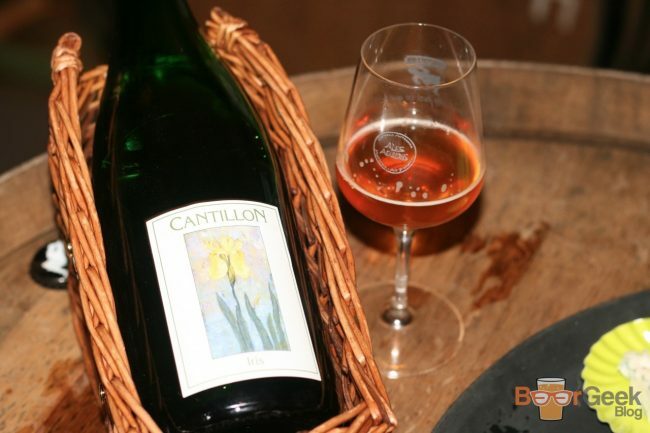 A lambic aged in six year old Vin Jaune wine barrels. I believe it’s a sweet wine. 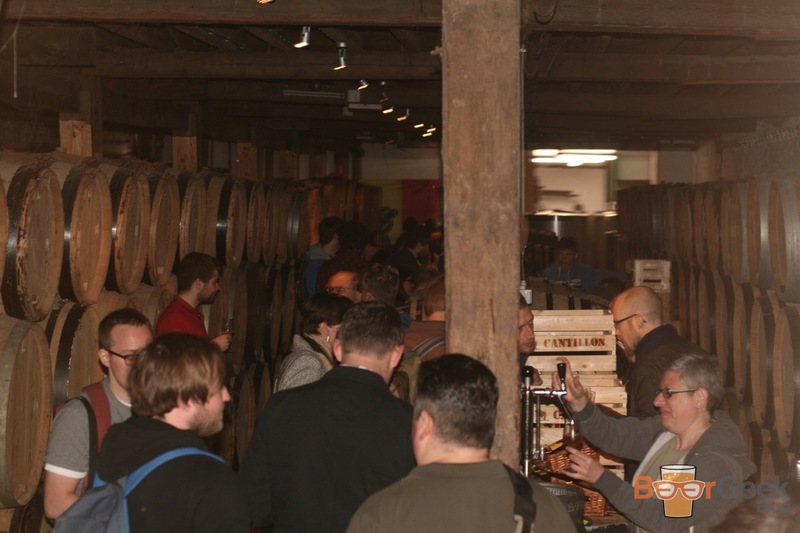 The beer certainly had sweet, sherry-like aromas and flavours. Along with some dried fruits, raisins and nuts. Almost like a dessert wine. Very unusual but intriguing and enjoyable in equal measure. 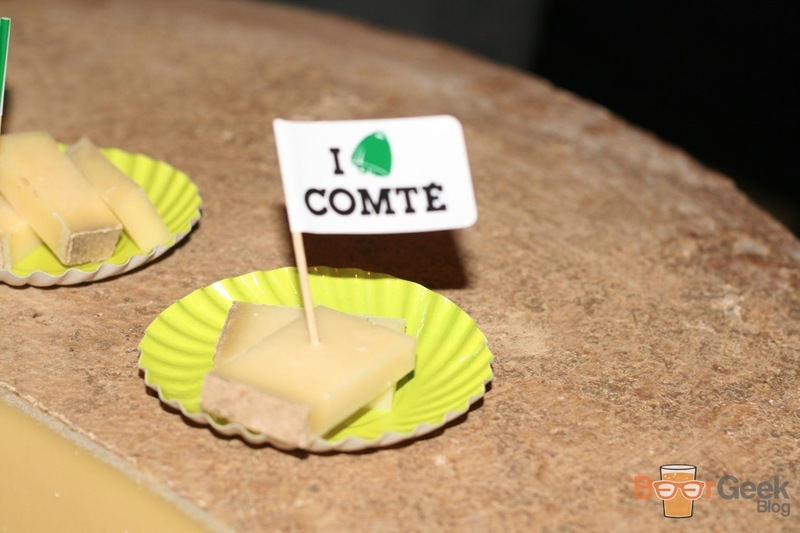 It was served with Comté cheese which worked brilliantly. 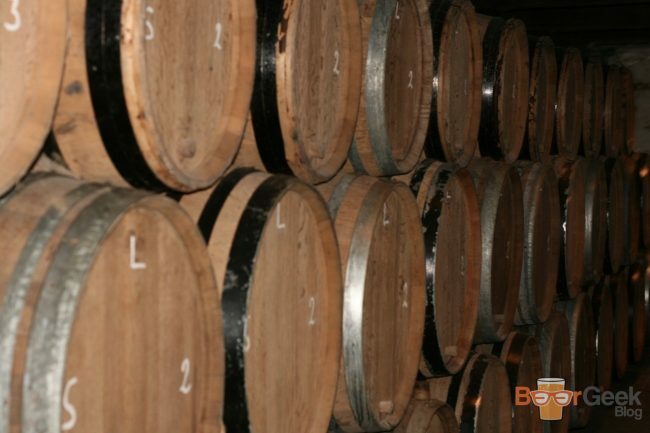 Who doesn’t love cheese and sherry? The final beer was another intriguing and complex delight. 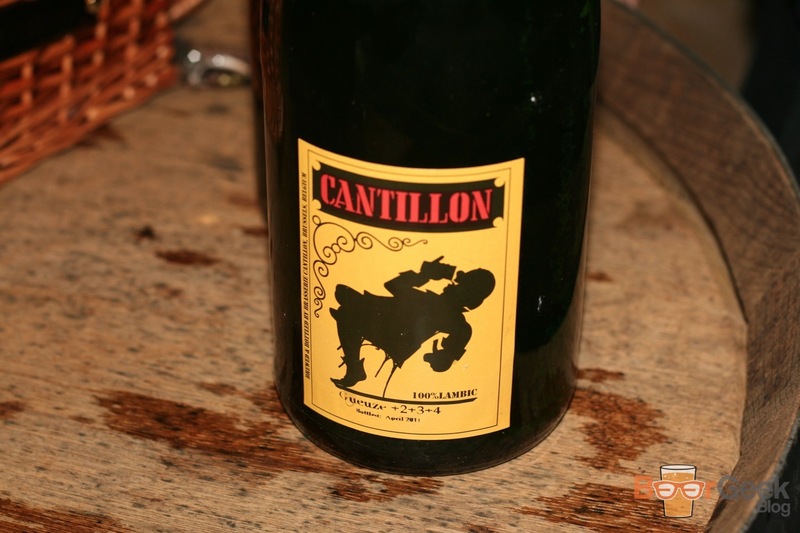 50°N-4°E, a lambic that’s been aged in Cognac casks, is named after the breweries geographical location. Fruity and rich with a warming, boozy sweetness coming through from the barrels. A fitting end. Only, it wasn’t quite the end. The bar had even more amazing beers available to buy. Both on draft or by the bottle. Despite my taste buds taking a battering over the last few hours from 20+ mouth puckeringly sour lambics I couldn’t resist going back for more. First Haute Densite, a 9% lambic which tasted like a boozy, slightly sour barley wine. 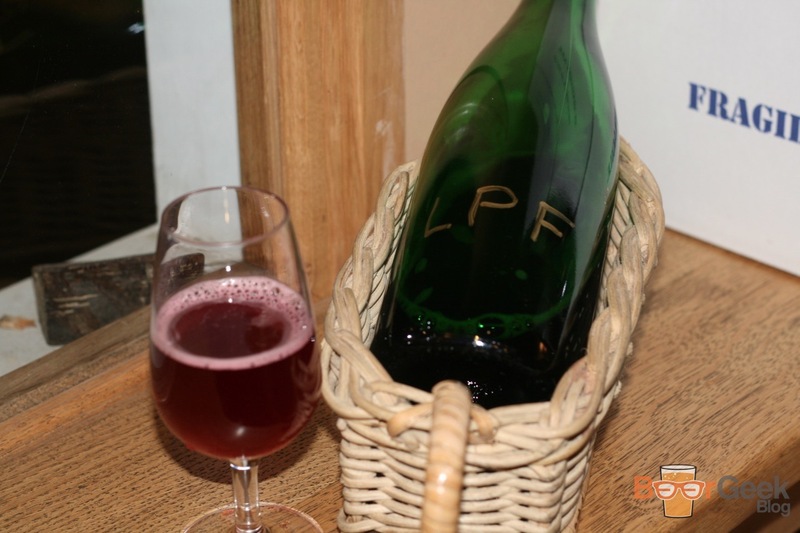 And then a stunning 2013 bottle of Lou Pepe Framboise. The amazingly coloured raspberry lambic was quite possibly the beer of the day. Dry, tart and fruity, bursting with fresh raspberry flavour. There’s some woodiness in there too and perhaps a touch of balsamic vinegar. But it’s really all about those raspberries. After a couple of purchases from the takeaway shop, it was finally time to leave. Amongst other bottled delights they were selling Aunis for the very first time. 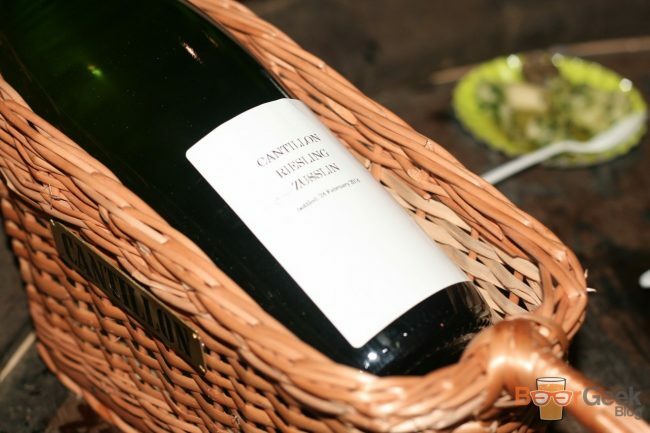 Each visitor was allowed to purchase just one bottle each. I was excited before my visit but it exceeded all of my expectations. 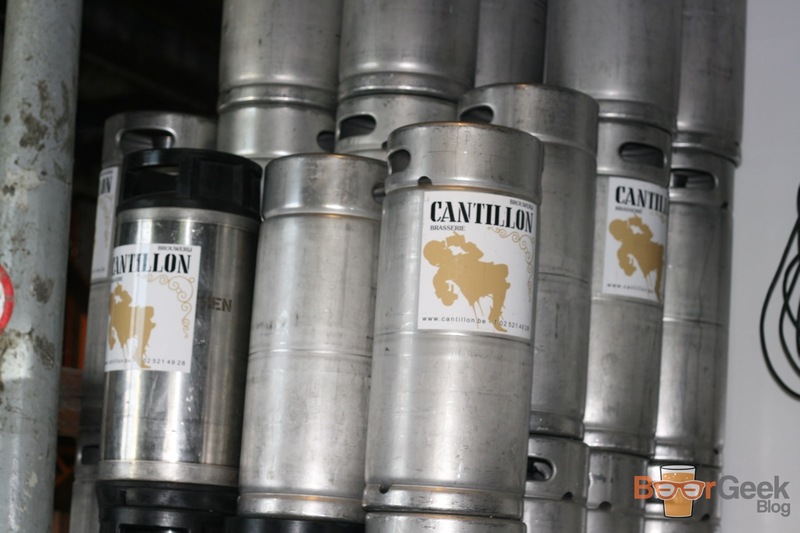 Not just the stunning array of beers. 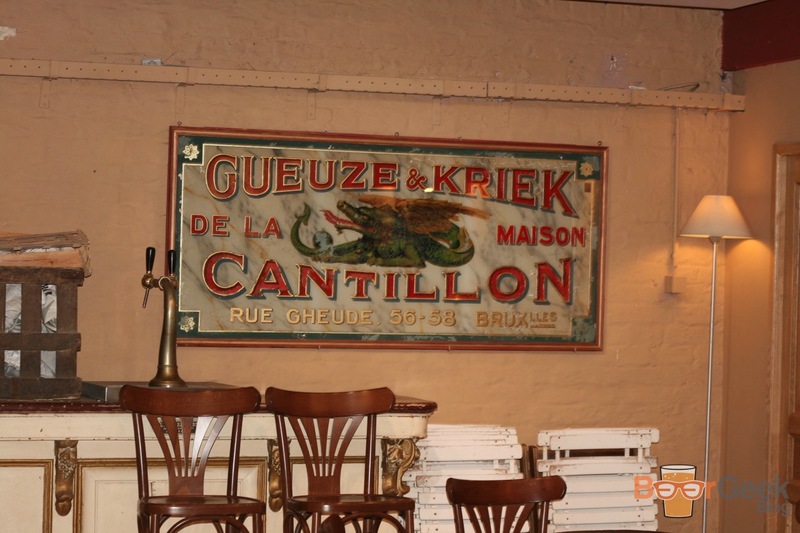 But the brewery itself is such a magical place, you can literally feel the history around you. It’s ridiculous value too at under £30 for 23 beers – most of them world class – and the food pairings too. It’s definitely going to end up as a highlight of the year and I’ll be booking a ticket for 2018’s Quintessence as soon as they’re released.